Spore is a Mac game in the Strategy genre. The game was published by Electronic Arts and developed by Maxis. The game has an ESRB Rating of E10+ (Everyone 10+) and was released on 2008-09-07. 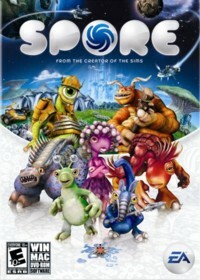 The game's official site can be found at www.spore.com. This game is a unique one in terms of scope and gameplay. In Spore the player guides an organism through the various stages of life. You begin the game as a micro-organism and you must play a game of survival of the fittest. :) You need to devour smaller organisms and grow and evolve. As you evolve you will be able to choose the life path of your creature and customize him/her to your liking :). Throughout the entire game you will evolve from an organism to a animal with legs to more advanced stages of development and you will form clans and then become a race. This path will eventually lead you to space and you will hopefully complete the game. I really enjoyed this game and the graphics and sound were well done. You can even go online and share your creations with the world. If I have to mention one negative is its that the game does not have immense replay-ability and many people dislike the games DRM (Digital Rights Management). This game is a definite buy for all the Sim fans out there that are curious about biology and evolution.